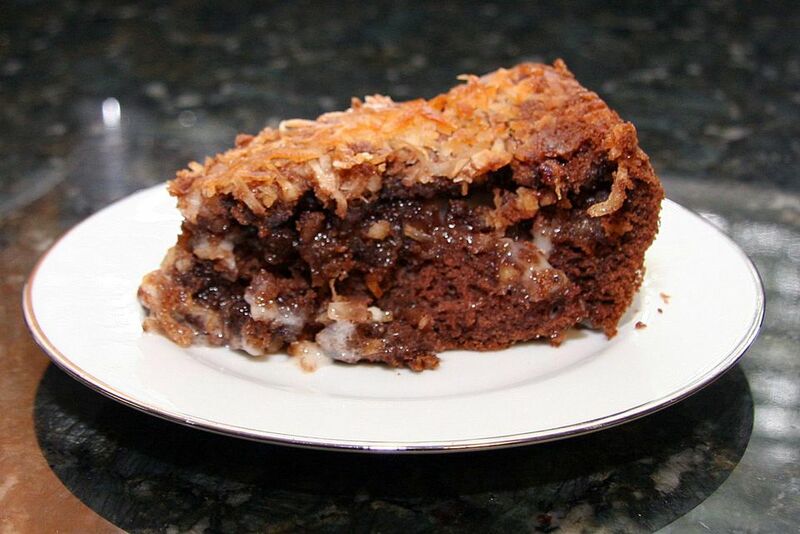 This fabulous chocolate upside-down cake is very easy to prepare with a German chocolate cake mix. Cream cheese, coconut, and chopped pecans make it an extra-special dessert, and it makes its own topping! There were 16 previous reviews. All but a few were 5-star reviews and comments. From the few negative reviews, the people said the cake spilled out over the sides of the pan. Most people — including me — didn't have the problem, but if you are using a pan that is slightly smaller or more shallow, place a large baking pan on the lower rack of the oven just in case. Heat oven to 350 F (180 C/Gas Mark 4) . Sprinkle coconut and pecans evenly over the bottom of the prepared pan. Prepare cake mix with water, oil, and eggs, following the package directions. Pour the cake batter over the coconut and pecans. Combine the cream cheese, butter, and confectioners' sugar in a mixing bowl. Beat until well blended. Drop by spoonfuls over the top of cake batter. Put the cake in the oven with a large baking pan under it just in case the mixture spills over a bit. Bake for about 45 to 50 minutes. A toothpick should come out clean when inserted into the center of the cake portion. To serve, cut into individual serving-size pieces and, using a spatula or cake server, remove from the pan and turn upside-down on dessert plates.